Wow. It has been so very very long since an update! The local machinist is brilliant! We’ve managed a couple of good prototypes. Got a superb custom reticle (HUGELY expensive, but necessary!) from an American company. This past couple months struggled with and found a solution for what I describe as ‘barrel distortion’ in the view. 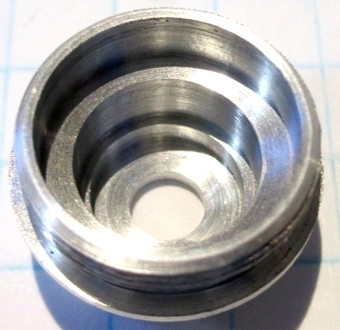 Got (several different) new lens kits and have re-machined the ‘bottom optic shell’ a couple times. We’ve about got it right! Picking up what we think is the final machined version this afternoon or tomorrow morning! The new reticles (also hugely expensive) came and checked out really well! The eyepiece lens kit came and works beautifully in the new eyepiece shell. The … sticking point … has been the bottom optic. When the whole prototype was put together, there was … distortion on the outer edges. (What I describe as ‘barrel distortion’; there’s a name for it, but I can’t remember it.) 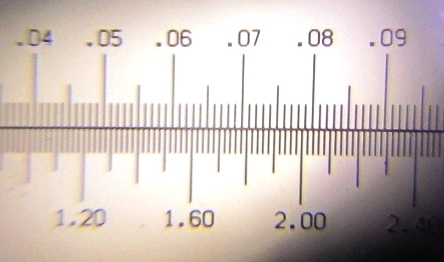 The scope focused okay, but the scale (the reticle) sort-of … expaaaaanded to read too long (on both the NIST block and the standard slide). Could get it focused, but then … oops. So, fingers crossed this is the final tweak needed. Plan is: if this IS it; I’ll be ordering ten of everything, assemble ten scopes and ten trial gauges. I have several customers who’ve been helpful (for YEARS!) testing the prototypes in their actual work, and so they and my major distributors will get a chance to whack ‘em around and see how they do. In the meantime, I’ll be trying to find a way to mass produce them that will NOT cost an arm-and-a-leg so I can put them into actual production. I know, over the past … since April 2012 (so, five years and four months!) I’ve been saying; I’m hopeful, I think maybe THIS time I’ve got it… and then it wasn’t. But — I REALLY think that this time I may have it!! This entry was posted in OG202, OG204, Scopes, Swap Program on 29 August 2017 by Elenor.